I'd appreciate some help in identifying and getting the history on a couple of baseball gloves that I found in my parents home. I'm building a shadow box to display them and will give them to my son for Christmas. I'd like to be able to tell him something about these gloves. 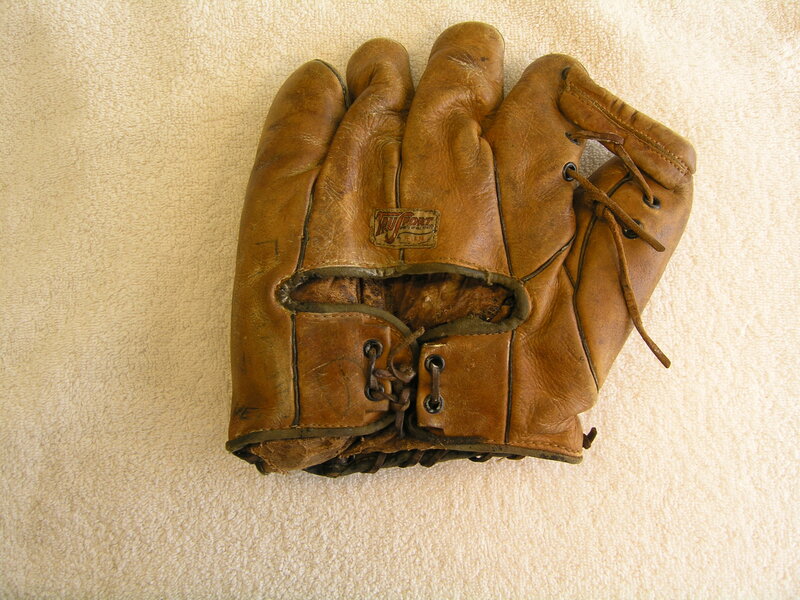 I believe the first glove is MacGregor Goldsmith G118 with a Pete Reiser trademark. My research shows this as from the 1940s or 1950s. Is there a way to identify the year more precisely? The second glove is more of a mystery to me. I can read "Lewis Style", but can't read other notations. The closest that I could find on this site is http://www.baseballglovecollector.com/g ... k-doug.jpg. Could this be the glove? There is no tag on the back on the fingers as shown in this photo. Thanks for any help that you guys can provide. Regards. Checking Joe Phillips' Vintage Glove Catalog Source Book, it shows the Reiser G118 glove was made in 1951-52 and possibly 1950 (there's no catalog info for that year.) Can't help you with the Lewis Style glove. The Lewis style is indicative of an early 1940's style. The Lewis most likely refers to Buddy Lewis as you surmised in your initial post. The Tru-Sport model was made by OK MFG Co. in Ada, OH and it's likely that yours could have been as well. There were a number of companies that sold a style similar so it's hard to pinpoint the exact company without a better look at the stampings. Sorry for the delay in responding. My heartfelt thanks for the insights provided. This is exactly what I was hoping to be able to tell my son about these gloves. Many thanks.